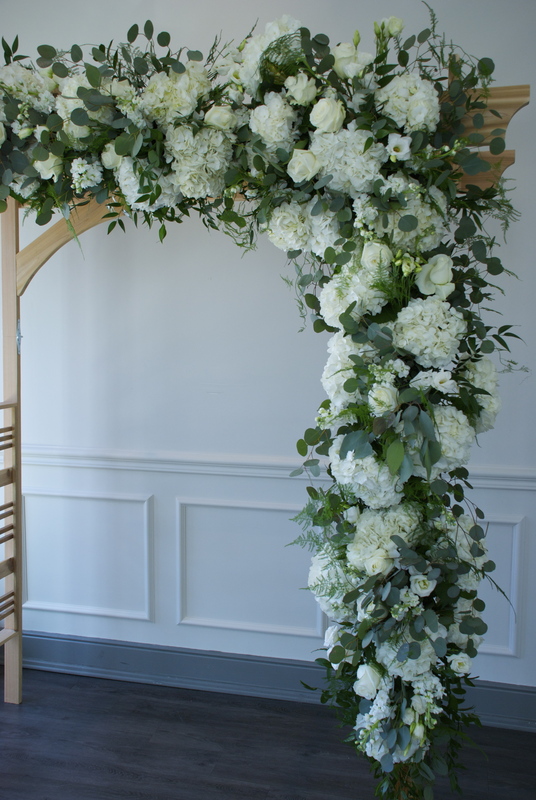 This arbour was created by the Groom and his father. They used it in the ceremony, then moved it to the reception afterwards. The arbour was going into a chapel and there was a tight time line to get the decor set up, so the arbour had to be set up and created in one spot, moved into the chapel, then moved out again into the reception venue after the ceremony was over. Luckily, it was all very close together at The Doctor’s House. They had to create the arbour with folding sides so it could fit under the chapel doors! They also were going to put the arbour up in their backyard in their new home. Isn’t that sweet? The arbour you got married under, also permanently in your backyard. So sweet! Here’s me working on the florals, creating a giant fluffy cloud of greens and whites for Kristina & Andrew to get married under. These are my assistant’s pictures, so I can’t wait to see what the professional photographer comes up with! Flowers used: hydrangeas, stock, lisianthus, roses, eucalyptus, italian ruscus and asparagus plumosa.